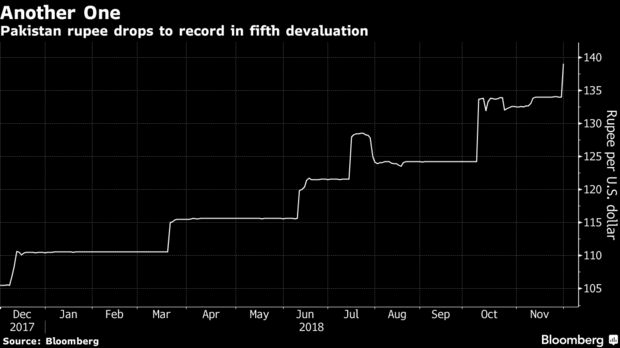 Pakistan’s government is considering setting up a new mechanism that will help the nation’s central bank smooth volatility in exchange rate movements after the currency was devalued for a fifth time this year. The government will be looking into “contours and scope” of how the central bank manages the currency as the existing way is not working well and needs a review, Noor Ahmed, the secretary at the economic affairs division, said by phone from Islamabad. The central bank should intervene in the currency in case of an abnormal fluctuation, he said. Pakistan is not alone in witnessing friction between its monetary policy makers and the government. U.S. President Donald Trump has repeatedly criticized the Federal Reserve for raising interest rates, while in India the government wants a larger share of the central bank’s capital. The latest move in Pakistan, which is negotiating a bailout package with the International Monetary Fund, comes after the central bank devalued the currency and raised borrowing costs on the same day. Abid Qamar, the chief spokesman for the Karachi-based central bank, declined to comment. The rupee advanced to 137.8 per dollar on Monday after declining 3.9 percent on Friday. The government should not dictate what the central bank should be doing, said Amjad Waheed, chief executive officer at NBP Fund Management Ltd. in Karachi. The incumbent, Governor Tariq Bajwa was appointed by the former Finance Minister Ishaq Dar in July 2017 after the rupee tumbled against the dollar, an issue blamed on a “miscommunication” by individuals and institutions. Pakistan is struggling with an economic crisis triggered by a rising current account deficit and dwindling foreign reserves. The finance ministry failed to reach an agreement with the IMF last month after talks stalled amid disagreements over tax and currency policies. The State Bank of Pakistan raised its policy rate to 10 percent from 8.5 percent on Friday. The nation has raised rates by 4 percentage points this year, making it the most aggressive hiker in Asia.